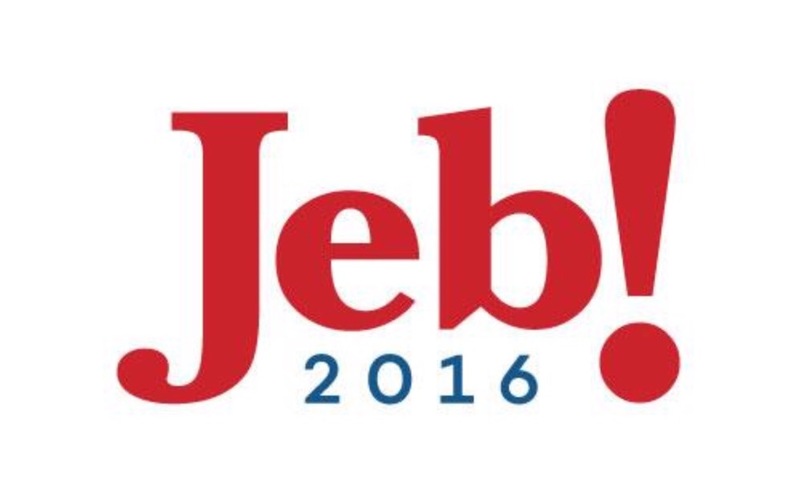 Jeb Bush tweeted his campaign’s logo today. Immediately questions were raised. Why Red? Why no Bush? Why the exclamation point? We here at UP@NIGHT have learned that this was in fact only a preliminary logo. It seems that there has been a debate in Jeb’s camp about how to handle his last name. They don’t want folks associating him with “W,” the man who gave us the Iraq War and who was in charge at the time of the great recession. Nor does Jeb want to remind people that his shenanigans were responsible for helping George to win Florida in 2000, giving him the presidency. On the other hand, George H. W. Bush is pretty well respected. He led the country in a successful war, the Gulf War, and had the good sense not to try to conquer Iraq. So, what to do? Team Jeb has an answer, a red, white and blue one. And we here at UP@NIGHT are proud to be the first to show it to the world. Ahh another up and comer bushwhacked! !